Brief Description: Everyone has heard of Darth Vader, the infamous Star Wars villain we all love to fear, created by George Lucas and brought to life by Dave Prowse MBE, but people may not be so familiar with the story of the multi-talented man behind the mask. It required someone exceptional to turn a helmeted costume into the principal character in the highest grossing film series in cinema history - that someone was Dave Prowse. The towering, physical presence of the 6ft 7” bodybuilder was ideally suited to personify the intimidating Darth Vader. Straight from the Force’s Mouth takes us behind the scenes of Star Wars and documents how this extraordinary man took on the role of the menacing central character to creating one of the most iconic villains in cinema history. In this book of memoirs, Dave shares his journey from disadvantaged child and poor student to champion weightlifter and international film star. 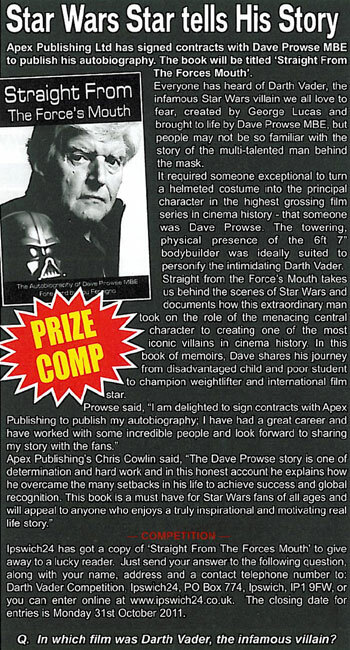 The Dave Prowse story is one of determination and hard work and in this honest account he explains how he overcame the many setbacks in his life to achieve success and global recognition. This book is a must have for Star Wars fans of all ages and will appeal to anyone who enjoys a truly inspirational and motivating real life story. Special Note: This book is also available as an eBook. An old edition of the paperback version carries the following ISBN: 978-1-782818-20-5. About the Author: Dave Prowse was born in Bristol in 1935. He was a disadvantaged child from a working class background and grew up without a father. As a teenager, Dave developed an interest in bodybuilding and competed in the Mr Universe contest alongside his lifelong friend Arnold Schwarzenegger. After training hard, he went on to win the British heavyweight weightlifting title and became a highly respected health and fitness trainer. Dave trained Christopher Reeve for his role as Superman and has also trained Albert Finney, Daniel Day Lewis, Vanessa Redgrave and many other well known stars. Prior to achieving fame with the Star Wars films, Dave was also known for his role as the ‘Green Cross Code’ man during the 1970s, heading up the UK Child Pedestrian Road Safety Campaign. He was awarded the MBE in the Millennium Honours List for his services to road safety and charity. His physique secured his entry into the world of show business and he is possibly best known for his portrayal of iconic villain Darth Vader in the Star Wars films, a role which catapulted him to international stardom. Dave has also appeared in a number of other films including A Clockwork Orange. Dave is the author of two previous books Fitness is Fun and Play Safe with the Stars and is in constant demand as a public speaker. 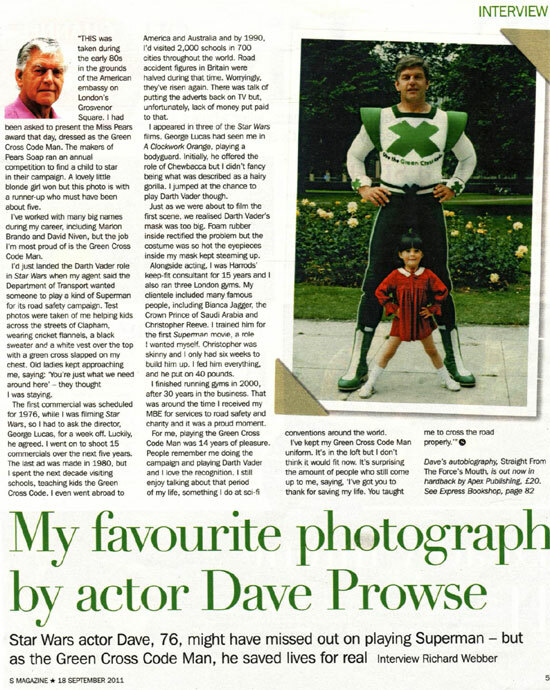 Dave Prowse's experiences will make for an awesome read. I’ve known Dave for many years and always had tremendous admiration and respect for the man. Dave and I go back to the days when I first competed in the NABBA Mr Universe contest and Dave had been the British Heavyweight Weightlifting Champion. Over the ensuing years our careers to some extent have followed similar lines: the promotion of physical culture as a way of life, films and TV, and supporting charities that are near and dear to us. Dave has been a successful athlete-champion weightlifter for three years and competitor at the World Weightlifting Championships and Commonwealth Games. For many years Dave ran three successful gyms plus an exercise consultancy in the world’s number one store - Harrods of London. His acting career started by playing the part of ‘Death’ on stage at the Mermaid Theatre and then moved on to numerous TV and film roles, which included working with Stanley Kubrick on A Clockwork Orange and George Lucas on the Star Wars trilogy, episodes 4, 5 and 6, playing the now iconic Darth Vader. The latter has brought him international fame and guest appearances at sci-fi and film conventions worldwide. Dave actively supports the work of several charities. He is Vice President of the Physically Handicapped and Able Bodied Association (PHAB) and is involved with charity work for the Royal Marsden Hospital (where he was treated successfully for prostate cancer), the Urology Foundation and UNICEF. Dave is also associated with the Reeve-Irvine Institute, which is dedicated to stem cell research, through his friendship with the late Christopher Reeve, whom Dave personally trained for the part of Superman. Dave’s autobiography is a roller-coaster ride through 50 years of amazing happenings, written with humour and lavishly illustrated with photos from his personal archive. Dave was awarded an MBE for his contribution to child pedestrian road safety and charity work. What sets Dave apart is his ability to persevere and overcome adversity, and he continues to reap success from all his endeavours due to his unstinting commitment. I’m inspired by Dave’s dedication to educating and influencing others in a positive way. 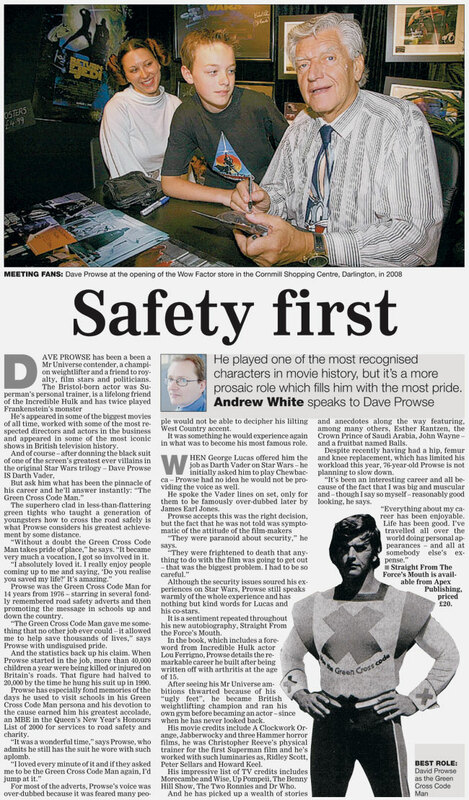 It’s an honour to call David Prowse my friend. THE man behind the mask, Dave Prowse, a firm favourite with Star Wars fans will be visiting Waterstone's bookstore in Yeovil. He will be the Middle Street store on Sunday, November 6, from noon to sign copies of his autobiography entitled Straight from the Force's Mouth. But his scheduled visit comes with a warning - he will be accompanied by some of Darth Vader's Stormtroopers. Waterstone's manager, Marcus Bishop, said: "I think I speak on behalf of all Star Wars fans when I say Dave Prowse is a legend and we are beyond excited to welcome Lord Vader to the shop. "And let's not forget he taught us all how to cross the road as well as The Green Cross Code Man." THE force was definitely with Darth Vader this weekend, as the iconic villain proved more popular than glamour modelling and cricket. 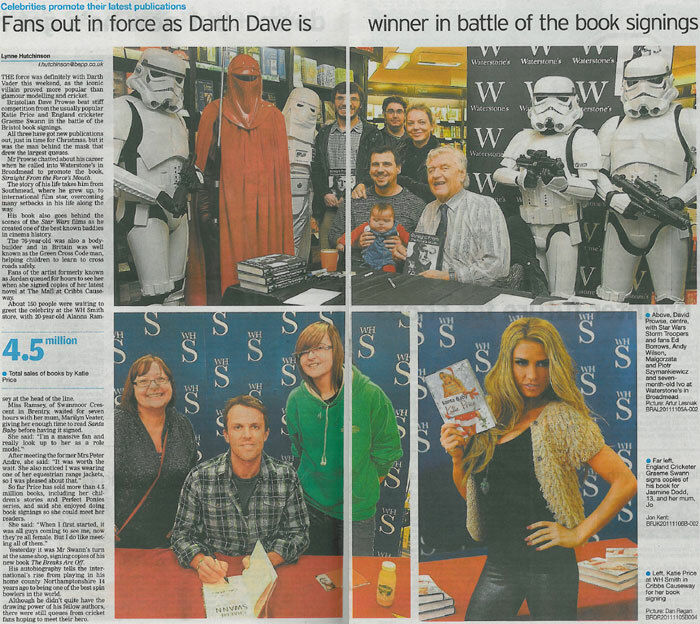 Bristolian Dave Prowse beat stiff competition from the usually popular Katie Price and England cricketer Graeme Swann in the battle of the Bristol book signings. All three have got new publications out, just in time for Christmas, but it was the man behind the mask that drew the largest queues. Mr Prowse chatted about his career when he called into Waterstone's in Broadmead to promote the book, Straight From the Force's Mouth. The story of his life takes him from Southmead, where he grew up, to international film star, overcoming many setbacks in his life along the way. His book also goes behind the scenes of the Star Wars films as he created one of the best known baddies in cinema history. The 76-year-old was also a bodybuilder and in Britain was well known as the Green Cross Code man, helping children to learn to cross roads safely. Fans of the artist formerly known as Jordan queued for hours to see her when she signed copies of her latest novel at The Mall at Cribbs Causeway. About 150 people were waiting to greet the celebrity at the WH Smith store, with 20-year-old Alanna Ramsey at the head of the line. Miss Ramsey, of Swanmoor Crescent in Brentry, waited for seven hours with her mum, Marilyn Veater, giving her enough time to read Santa Baby before having it signed. She said: "I'm a massive fan and really look up to her as a role model." After meeting the former Mrs Peter Andre, she said: "It was worth the wait. She also noticed I was wearing one of her equestrian range jackets, so I was pleased about that." So far Price has sold more than 4.5 million books, including her children's stories and Perfect Ponies series, and said she enjoyed doing book signings so she could meet her readers. She said: "When I first started, it was all guys coming to see me, now they're all female. But I do like meeting all of them." Yesterday it was Mr Swann's turn at the same shop, signing copies of his new book The Breaks Are Off. His autobiography tells the international's rise from playing in his home county Northamptonshire 14 years ago to being one of the best spin bowlers in the world. Although he didn't quite have the drawing power of his fellow authors, there were still queues from cricket fans hoping to meet their hero. THE force really was with Darth Vader star Dave Prowse on a book signing visit to Sheffield - first in the queue was police force civilian worker Steve Matthewman. “I booked the day off work to come and meet him. He’s such an icon - not just for his part in Star Wars, but Hammer films and other movies,” said Steve, aged 46, from Chesterfield, who works for Derbyshire police force. Star Wars legend Dave was the man behind the mask in the first three original movie, but he appeared unmasked to meet scores of fans, many who queued for more than an hour to see him, at a book signing session in Waterstone’s, in Orchard Square. The 6ft 7ins former bodybuilder, now aged 76, cut a less forbidding appearance in striped jumper and open-necked shirt as he signed around 100 copies of his autobiography, Straight From The Force’s Mouth. The book charts his rise from disadvantaged child and poor student to champion weightlifter then star of the highest-grossing film series of all time. Dave was brought up in Bristol by a single mother but in his book he tells how ‘determination and hard work’ saw him become British heavyweight weightlifting champion. He competed in Mr Universe with pal Arnold Schwarzenegger and trained Christopher Reeve for his role as Superman. He was also the Green Cross Code man in the 1970s, helping to halve child injuries and deaths on the roads from 40,000 to 20,000 a year. It earned him the MBE. THE force will very much be in Lynn later this month when none other than Darth Vader himself will pay a visit from the Dark Side. 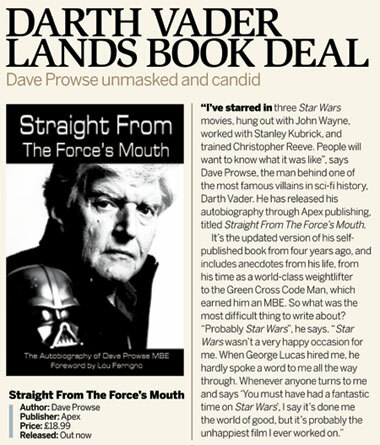 Dave Prowse MBE, who played the iconic character in the legendary Star Wars films, is coming to Waterstone’s in Norfolk Street to sign copies of his new book - Straight From the Force’s Mouth. The book takes readers behind the scenes of Star Wars and documents how Dave took on the role of the menacing central character to creating one of the most well-known villains in cinema history. Dave, who was famously The Green Cross Code man before he landed the part which would change his life, has written three books, and will be signing copies of his latest offering and chatting to the crowd. He will be dropping off from his tour of the universe on Saturday, November 26, between noon and 3pm. The man behind Darth Vader’s mask will be the (death) star guest at an event this weekend. 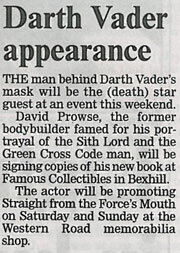 David Prowse, the former bodybuilder famed for his portrayal of the Sith Lord and the Green Cross Code man, will be signing copies of his new book at Famous Collectibles in Bexhill. The actor will be promoting Straight from the Force’s Mouth on Saturday and Sunday at the Western Road memorabilia shop. THE “Force” was definitely in Lynn on Saturday (November 26) when none other than Darth Vader himself paid a visit. Dave Prowse, who played the towering Darth from the Dark Side in the Star Wars’ films, was at the Waterstone’s book store in Norfolk Street to sign copies of his new book - called Straight From the Force’s Mouth. Between 150 and 200 people turned out to see the iconic actor, some donning costumes from the classic 1977 film which was followed by an equally successful movie series. It was the first time he and assistant manager David Learner had met since they both appeared in the BBC’s television version of The Hitch Hiker’s Guide to the Galaxy. Dave, who formerly found fame as the Green Cross Code Man, was bodyguard to rock God Hotblack Desiato; David was Marvin the Paranoid Android. The signing session, which lasted from 11.15am to 3.30pm, was hugely successful with copies of the book selling out. Nothing was too much trouble for Dave who also signed photographs and figures said David, adding the book can still be ordered through the Lynn store. STAR Wars arch-baddy Darth Vader, Lord of the Sith and Servant to His Supreme Excellency the Emperor Palpatine, is due to cause a stir in Bexhill this weekend. The black-clad, light sabre wielding villain, alias actor and bodybuilder Dave Prowse, is set to spend Saturday and Sunday, October 8 and 9, at the Famous Collectables shop in Western Road. There 6ft 7ins Dave, also known for his role as children’s road safety mentor, the Green Cross Man, will meet and greet customers and sign copies of his new book, Straight from the Force’s Mouth, which recalls his role in the cult Star War movies and other life and career accomplishments. Dave, who is still recovering from hip, thigh and knee surgery earlier this year, can be seen from 11am to 5pm both days. Local hotelier and president of Bexhill Chamber of Commerce and Tourism, James Kimber, is understood to be providing overnight accommodation for the star. It is hoped to highlight the inter-galactic warrior’s arrival in town with a parade of classic cars, courtesy of Bexhill 100 Motoring Club. 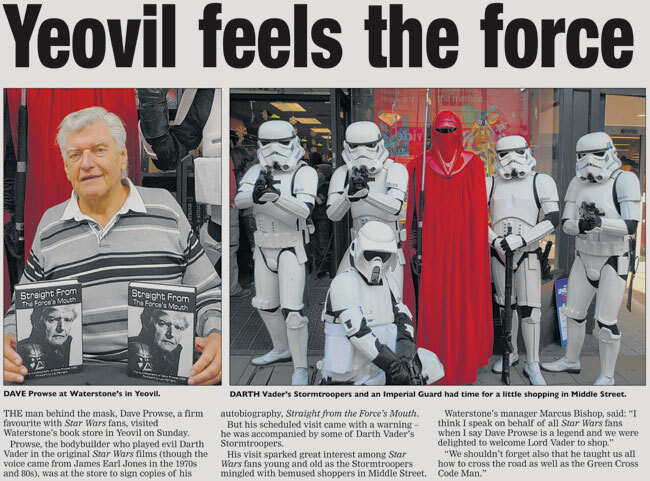 With storm troopers patrolling a shopping centre forecourt and dedicated fans queuing for hours, Dave Prowse, aka Darth Vadar, launched a tour promoting his autobiography in his adopted home town. Prowse, who alongside playing the iconic baddie from the Star Wars movies is also a former weightlifting and bodybuilding champion, moved to a small flat in Thornton Heath more than 40 years ago, and even after stardom has taken him across the globe, he always come back to Croydon, now owning a home in Addiscombe. Appearing at Waterstones in the Whitgift Centre, Croydon, on Saturday October 15 Prowse said he still loves to meet with his fans, who turned out in droves. Robert Kirby, 42, of Goodenough Way, Old Coulsdon, was first in line to meet him after queuing from 9am when the Whitgift opened. 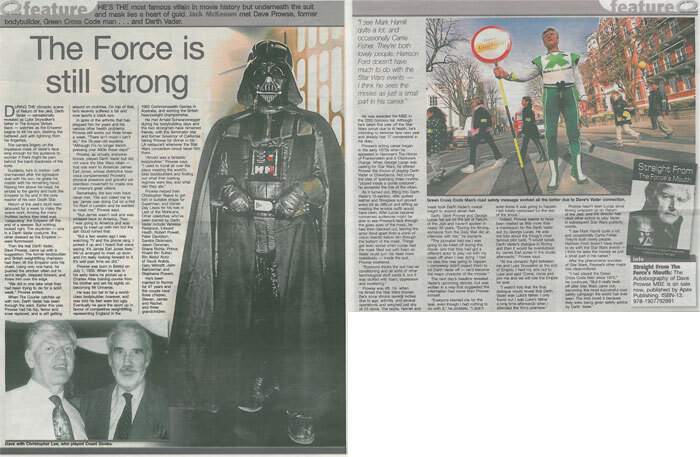 Best known as the towering Vadar, Prowse is actually most proud of his work with the Green Cross Code, where he was cast as the Green Giant, for which he earned an MBE. A father and grandfather, Prowse has also overcome prostate cancer and is recovering from a serious operation which saw his hip, right femur and right knee replaced, but says he is on the mend. 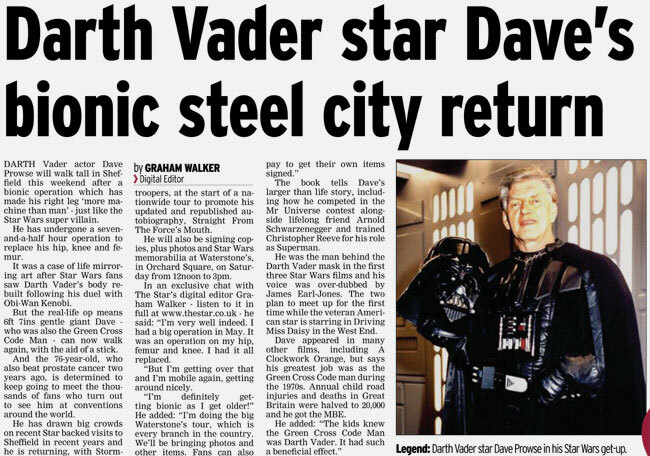 Dave Prowse, aka Star Wars’ Darth Vadar, will be in Croydon to promote his long-awaited autobiography. Prowse, who comes from Addiscombe, will be at Waterstone’s in Croydon on October 15 as part of a whirlwind tour of the UK. In Straight from the Forces Mouth, Prowse, who stands at an imposing 6ft 7in, will give an insight into life working on one of the best-loved films of all time. The 76-year-old also tells of his struggles in childhood, his time as a body builder and his stellar acting career, encompassing not only George Lucas’s cult sci-fi films but also A Clockwork Orange and The Hitch Hiker’s Guide to the Galaxy. In 2000 he was made an MBE and has also battled with prostate cancer. Straight from the Forces Mouth is now on sale and Prowse plans to be in Waterstone’s, the Whitgift Centre Croydon on October 15. 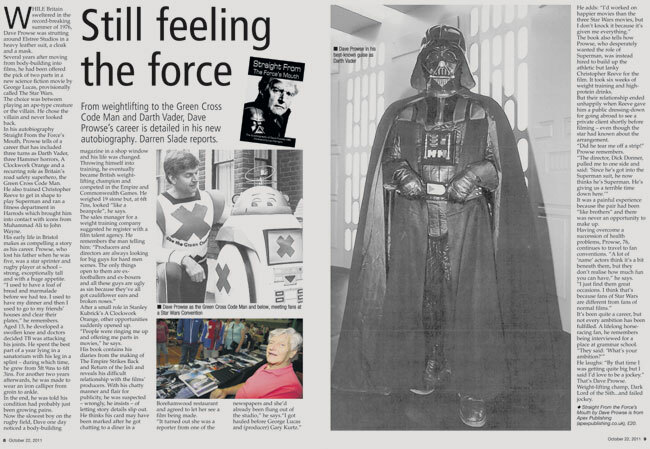 Dave Prowse, 76, who played both Darth Vader and the Green Cross Code Man, talks about his life and his finances. I was born before the war; my father was a sheet metal worker for the Bristol Aeroplane Company while my mum looked after the family. When I was about five my father went into hospital for an operation to fix a duodenal ulcer and never came out – he died through complications. It was a terrible blow to my mother as he died without life insurance, so of course it left my mother with three young children to support with no money whatsoever. She had a mortgage to pay so, to make ends meet, she had to take in as many lodgers as she could, and do all the cooking and cleaning for them. We never ever had any money, I just remember during my school years the house being full of lodgers and my mother having to work extremely hard. I don't remember a lot about the war years, other than food was rationed and we had to use coupons to get food from the shops. When I did leave school to go to work, it was purely to earn money. I didn't really think about a career; I think I missed having a male influence in my life, as I pretty much ended up making all my own decisions about what I did. HAS THERE BEEN A TIME IN YOUR LIFE WHEN YOU DIDN'T KNOW HOW YOU WERE GOING TO PAY THE BILLS? Yes, there have been quite a few times. At the beginning of my earning days it was always tough, as my main focus from the age of 15 was bodybuilding, so I just took jobs that suited my training; everything I did was devoted towards training. I'd chuck in a job if they wanted me to work overtime – I could always get a job as I had a grammar school education and had some GCEs. I took one job as a check weighman as I thought I'd get free meat from it, but instead I nearly got sacked from picking up three pig's kidneys from the floor that were covered in sawdust, to take home and cook up for the cat. At various times I've had business setbacks involving serious losses of money; lack of money had always been a worry until the past 10 years or so, when things brightened up a bit. WAS BECOMING A BODYBUILDER YOUR BEST BUSINESS DECISION? I'm not sure it was a conscious business decision, but I was so driven to succeed it was my all-consuming passion. Making money out of that interest just seemed the natural way to go. I was British heavyweight lifting champion from 1962 to 1964, and out of that I was offered a job as sales director to Weider, who were the biggest supplier of weight training equipment in the world. By then I was married, so I was much more focused on making money. Around 1965-66, I also became the face of Bullworker, a piece of exercise equipment, and my face was everywhere on advertisements. Although it was selling as a mail-order product and I was endorsing it for a small residual, I had great problems trying to get my earnings out of the company, which I desperately needed to pay the deposit on the house I was buying. I then opened up the first club at the National Sports Centre, after a weightlifting exhibition at the opening ceremony where I met the director, Emlyn Jones. I then opened up the first of three gymnasia that I ran from 1969 to 2000. YOU'VE HAD SEVERAL STRANDS OF INCOME OVER YOUR WORKING LIFE – WHICH HAVE WORKED OUT THE BEST? The fitness/training side was the bread and butter side of things – it was more of a labour of love than anything to run gyms, they never made money. I got a job for 15 years working as a fitness consultant for Harrods. I also worked as a personal trainer to many celebrities. Getting into acting was really key to me making more money – so many opportunities came from contacts I'd made via films and television. WAS THE ACTING, PARTICULARLY THE ROLE OF DARTH VADER, THE START OF MAKING BETTER MONEY? I started working in commercials and television and film from the mid-Sixties, so by the time I did Star Wars in the mid-Seventies I had an established agent and the income was helpful in supplementing my other fitness interests. Around the time I was filming I was hired to be the Green Cross Code man from 1976 to 1980, and then employed for 10 years as a freelance trainer for the Department of Transport, touring schools and teaching children about road safety. Everyone knows me for the Darth Vader role, but in reality I get more recognition for the road safety work. However, since a whole industry has been set up around Star Wars, with conventions and memorabilia and merchandising, I now make a comfortable living attending science fiction conventions, meeting fans in person and selling autographs, etc. I also run a small business selling autographs and photographs from my website (http://www.darthvader-starwars.com). Starting my own bodybuilding magazine in the mid Sixties. I used the Bullworker mail-order business to start up a modest magazine, called Power, but then decided I wanted to be on the news-stands and I had absolutely no idea how that whole business worked. I ended up producing thousands of magazines only to find they weren't selling and rapidly ran out of money. It was a huge learning curve. In the end I had to go into voluntary liquidation, and almost had a nervous breakdown over it. I picked myself up by returning to freelance sales, focusing on Speedo swimwear and the Bullworker and other weight training equipment. I think I am a bit of both. I'm an eternal optimist. One of my favourite songs is Always Look on the Bright Side of Life; I always see the ups and never see the downs and so consequently I go into things head first, and then unfortunately the downs appear in one's life. So when I have had money I have made some decisions about new businesses which haven't worked out as well as they could. I own just one house, which I bought in 1964. I don't lead an extravagant lifestyle. I've never been that interested in making money work for me. Just earning it has been hard enough. Managing money and putting it into savings accounts – that is just not me. I have an accountant who has helped me that way with sorting out pensions, Isas (I think I have a couple but can't remember the details) or anything like that. Anything you enter into, make certain you know all the ins and outs of contracts, so that everything is basically in your favour so that if anything goes wrong you can always go back to the contract. I got in a horrendous mess when I set up a business with a partner to market Hammer Horror merchandise – as I'd worked in a couple of films as an actor, I'd met the top people and a business colleague and I decided the opportunity was there. However, we rapidly discovered that Hammer owned virtually nothing of its merchandising, and we'd have to pay various other people royalties if we did make anything; it just cost me a lot of money and I ended up resigning as director of the company and handing everything over to my business partner. Not a happy experience. Cash, wherever I possibly can. I have credit cards, but I hardly ever use them; if I do, I always pay them off within the month. I have a debit card for the company accounts. I bank with NatWest; I did bank with Coutts years ago. I have various pensions, which I took out over the course of my life, and they are giving a reasonable dividend. WHAT ARE YOUR FINANCIAL PRIORITIES FOR THE NEXT FIVE TO 10 YEARS? I'm now 76, I don't know how many more years I've got in front of me, but the way I feel now I feel I can go on for at least another 15 years. I never want to be in the situation again where I don't know where the next bit of money is coming from. I've got a nice house, nothing is owed, I've paid off the mortgage, my work activities are bringing us sufficient money to keep us happy and I can carry on doing it. I want to carry on earning for my family and grandchildren as long as I can. I have an accountant who comes to see me on a regular basis. No, I'm not. I don't think you should have to tip, to be perfectly honest, unless it is something really exceptional or you know the people working with you. You agree on the price, I don't think you should tip them on top of that. I always tip the nominal 10pc – I don't go overboard in restaurants or cabs. No. I am really not very comfortable using the internet, my wife handles all my emails and that kind of thing. I am old-fashioned so I prefer to go down to the bank, and pay money in and see real people. I have a good relationship with the bank manager. Not so much makes you happy, more that it allows you to live without worry, which I think is very important, as being stressed about money does affect your sense of wellbeing. I think lack of money is one of the biggest causes of stress in the world. To be financially sound, and to be out of that worry zone, I think that is where we all want to be. And to be able to give to your children and grandchildren, it is nice to be able to help. Star Wars legend: Darth Vader star Dave Prowse will sign copies of his autobiography at Waterstone's in Orchard Square, Sheffield, on Saturday, October 22, 2011, 12 noon to 3pm. DARTH Vader actor Dave Prowse will walk tall in Sheffield this weekend after a bionic operation made his right leg ‘more machine than man’ - just like the Star Wars super villain. He has undergone a seven-and-a-half hour operation to replace his hip, knee and femur. It was a case of life mirroring art after Star Wars fans saw Darth Vader’s body rebuilt following his duel with Obi-Wan Kenobi. But the real-life op means 6ft 7ins gentle giant Dave - who was also the Green Cross Code Man - can now walk again, with the aid of a stick. And the 76-year-old, who also beat prostate cancer two years ago, is determined to keep going to meet the thousands of fans who turn out to see him at conventions around the world. He has drawn big crowds on recent Star backed visits to Sheffield in recent years and he is returning, with Stormtroopers, at the start of a nationwide tour to promote his updated and republished autobiography, Straight From The Force’s Mouth. He will also be signing copies, plus photos and Star Wars memorabilia at Waterstone’s, in Orchard Square, on Saturday from 12noon to 3pm. In an exclusive chat with The Star’s digital editor Graham Walker he said: “I’m very well indeed. I had a big operation in May. It was an operation on my hip, femur and knee. I had it all replaced. “But I’m getting over that and I’m mobile again, getting around nicely. The book tells Dave’s larger than life story, including how he competed in the Mr Universe contest alongside lifelong friend Arnold Schwarzenegger and trained Christopher Reeve for his role as Superman. He was the man behind the Darth Vader mask in the first three Star Wars films and his voice was over-dubbed by James Earl-Jones. The two plan to meet up for the first time while the veteran American star is starring in Driving Miss Daisy in the West End. Dave appeared in many other films, including A Clockwork Orange, but says his greatest job was as the Green Cross Code man during the 1970s. Annual child road injuries and deaths in Great Britain were halved to 20,000 and he got the MBE. STAR Wars fans will have the chance to meet Darth Vader in Derby this weekend. 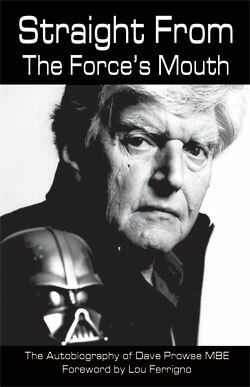 David Prowse, who played the villain in the original film trilogy, will be signing copies of his autobiography, Straight From The Force's Mouth, at the city centre branch of book shop Waterstones. Mr Prowse will be at the store in St Peter's Street, from 11am on Saturday. HE is coming to turn Winchester to the dark side. 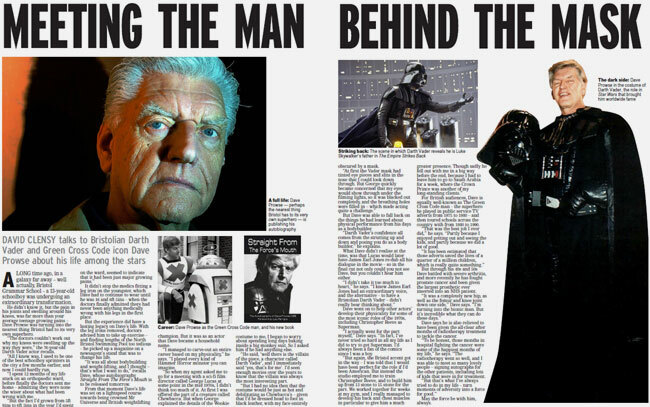 Dave Prowse, the man who portrayed the iconic villain Darth Vader in the original Star Wars films, is coming to the city along with his new book. The author will be signing copies of his memoirs, ‘Straight From the Force’s Mouth’, at Waterstone’s on Saturday, January 14. Mr Prowse, 76, is also well known for his role as the Green Cross Code man during the 1970’s, leading the campaign for road safety for children. He also worked as a health and fitness trainer, working with Christopher Reeve, Daniel Day Lewis and Albert Finney. It comes shortly after the death of Hampshire-born Bob Anderson, a legendary Hollywood swordsman who shared the Darth Vader suit for fighting scenes. Mr Prowse will be at the book shop from 11am-2pm. 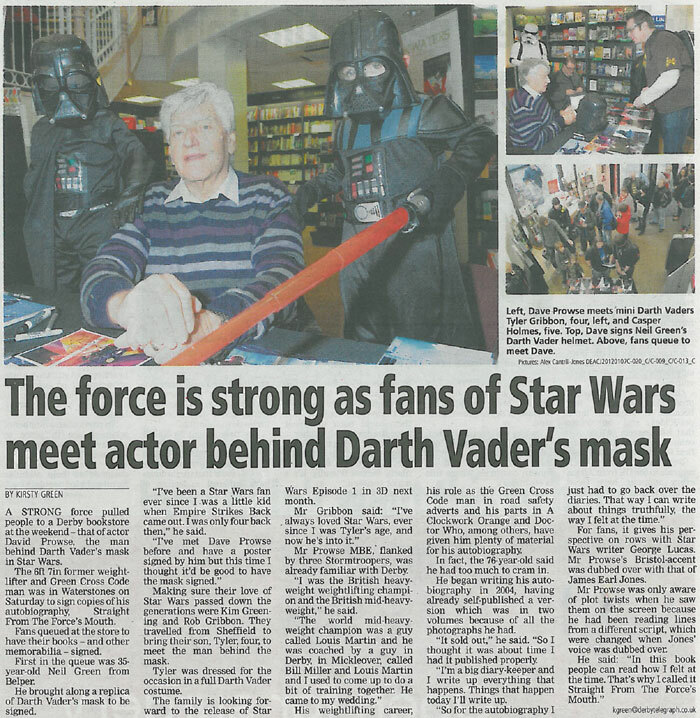 A STRONG force pulled people to a Derby bookstore at the weekend – that of actor David Prowse, the man behind Darth Vader's mask in Star Wars. The 6ft 7in former weightlifter and Green Cross Code man was in Waterstones on Saturday to sign copies of his autobiography, Straight From The Force's Mouth. Fans queued at the store to have their books – and other memorabilia – signed. First in the queue was 35-year-old Neil Green from Belper. He brought along a replica of Darth Vader's mask to be signed. "I've been a Star Wars fan ever since I was a little kid when Empire Strikes Back came out. I was only four back then," he said. "I've met Dave Prowse before and have a poster signed by him but this time I thought it'd be good to have the mask signed." Making sure their love of Star Wars passed down the generations were Kim Greening and Rob Gribbon. They travelled from Sheffield to bring their son, Tyler, four, to meet the man behind the mask. Tyler was dressed for the occasion in a full Darth Vader costume. The family is looking forward to the release of Star Wars Episode 1 in 3D next month. Mr Gribbon said: "I've always loved Star Wars, ever since I was Tyler's age, and now he's into it." Mr Prowse MBE, flanked by three Stormtroopers, was already familiar with Derby. "I was the British heavyweight weightlifting champion and the British mid-heavyweight," he said. "The world mid-heavyweight champion was a guy called Louis Martin and he was coached by a guy in Derby, in Mickleover, called Bill Miller and Louis Martin and I used to come up to do a bit of training together. He came to my wedding." His weightlifting career, his role as the Green Cross Code man in road safety adverts and his parts in A Clockwork Orange and Doctor Who, among others, have given him plenty of material for his autobiography. In fact, the 76-year-old said he had too much to cram in. He began writing his autobiography in 2004, having already self-published a version which was in two volumes because of all the photographs he had. "It sold out," he said. "So I thought it was about time I had it published properly. "I'm a big diary-keeper and I write up everything that happens. Things that happen today I'll write up. "So for the autobiography I just had to go back over the diaries. That way I can write about things truthfully, the way I felt at the time." For fans, it gives his perspective on rows with Star Wars writer George Lucas. Mr Prowse's Bristol-accent was dubbed over with that of James Earl Jones. Mr Prowse was only aware of plot twists when he saw them on the screen because he had been reading lines from a different script, which were changed when Jones' voice was dubbed over. He said: "In this book people can read how I felt at the time. That's why I called it Straight From The Force's Mouth." The author will be signing copies of his memoirs, Straight From the Force’s Mouth, at Waterstone’s on Saturday, January 14. Mr Prowse, 76, is also well known for his role as the Green Cross Code man during the 1970s, leading the campaign for road safety for children. A LONG time ago, in a bookshop far, far away (in Bicester) Dave Prowse, above left, signed copies of his long-awaited autobiography. And the towering actor who played Darth Vader in George Lucas’s classic science fiction trilogy certainly did not disappoint his fans. He may have left the famous mask at home but Mr Prowse was clearly still in character as he re-enacted his alter ego’s famous choke grip on thrilled Logan Hall, seven, right, from Caversfield. Mum Virginia Hall said Logan was delighted to meet the actor at Cole’s Bookstore with sister Marley, three. She said: “He is a huge Star Wars fan. “Everything in his room is Star Wars, every book we get out is Star Wars. Mrs Hall said Mr Prowse — who was flanked by storm troopers as he signed copies of Straight from the Force’s Mouth — was quick to remind Logan not try the choke grip at home. Shoppers at Southside shopping centre in Southfields had a shock on Saturday when Darth Vader himself turned up at Waterstone's. The man who played the infamous Star Wars villain, actor David Prowse MBE, was in town last weekend to sign copies of his new book Straight from the Force's Mouth. The book goes behind the scenes of Star Wars and documents how he took on the role of the menacing central character to creating one of the most iconic villains in cinema history. It also charts his rise from disadvantaged child and poor student to champion weightlifter and international film star. He said: "This book is a must have for Star Wars fans of all ages and will appeal to anyone who enjoys a truly inspirational and motivating real life story." Poor old Katie Price. 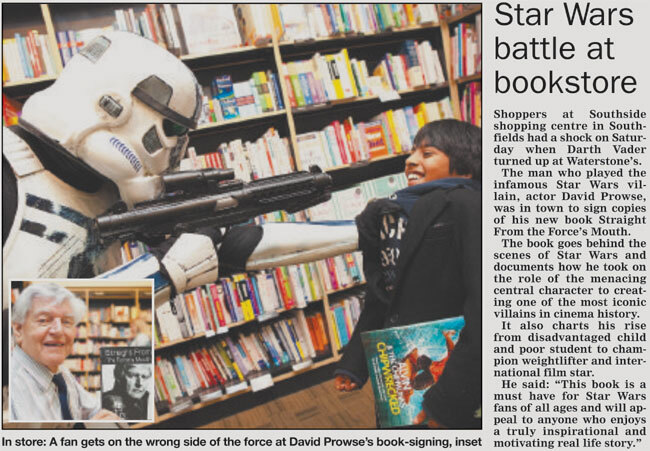 Though about 150 people queued for her book-signing session at the Bristol branch of WH Smith, this was not as many as lined up in nearby Waterstones where the 76-year-old actor Dave Prowse was signing copies of Straight From The Force's Mouth, about his life as Darth Vader in the Star Wars movies. THE grand switch on of the Christmas tree lights in Hitchin was attended by a bumper crowd. Hundreds flocked to Market Place on Friday evening (November 25) for the event which saw festive fun kick off at around 5pm, with singing group the Christmas Belles providing stirring renditions of crimbo classics. Among the stalls there on the night, ones run by The Radcliffe Arms and Halseys supplied hot food while Bar Absolute supplied the mulled wine and cider. The lights were switched on at 6pm by raffle winner Jerry Spencer and Heart FM breakfast presenter Stuart Miles. More harmonious song was provided by the Covenant Praise Community Choir. 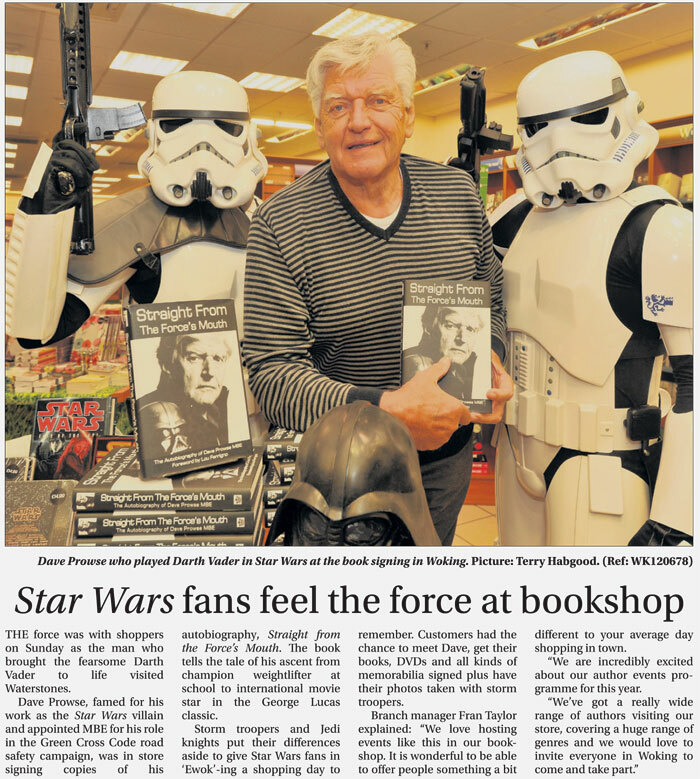 The book shop Waterstones had a busy evening when actor Dave Prowse – best known for playing Darth Vader in the sci-fi classic Star Wars films – arrived to sign copies of his latest book. Doors had to open early because the crowds were building up. Town centre manager Keith Hoskins said: “We’re really pleased with how it went. It was probably our best crowd ever. “Previously its being a case of everyone turning up at ten-to-six and then going home after the switch on but this time they hung around for some time. 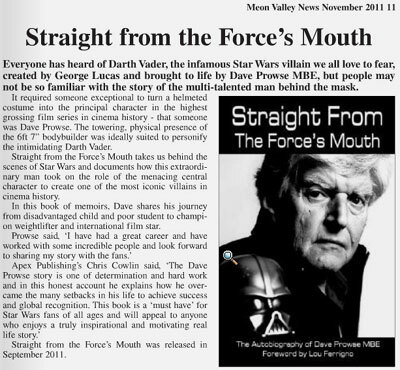 The infamous Star Wars villain - real name David Prowse - will be signing copies of his latest book, Straight from the Force’s Mouth, at Waterstone’s in Market Place between 5pm and 7pm. 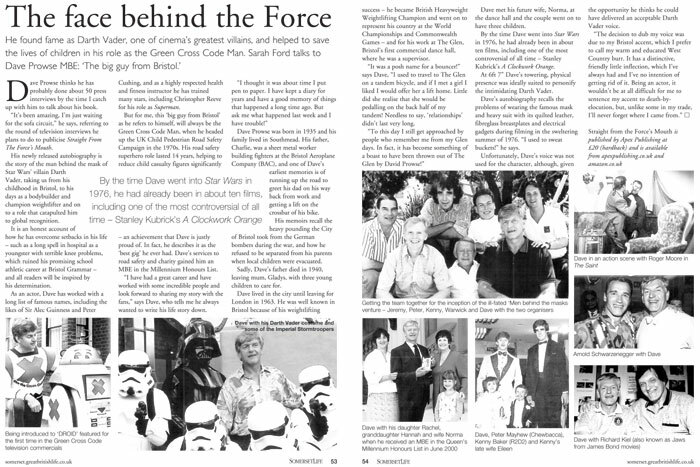 The book takes a look behind the scenes of Star Wars and documents how he came to land the role, following a career as a bodybuilder in which he went on to win the British heavyweight weightlifting title. David is also known for his role as the ‘Green Cross Code’ man during the 1970s, heading up the UK Child Pedestrian Road Safety Campaign. He was awarded the MBE in the Millennium Honours List for his services to road safety and charity. DAVE PROWSE, the man behind the menacing mask of Star Wars baddie Darth Vader, is to share his story in a new autobiography published later this month. Straight From The Force's Mouth, which hits shelves on September 17, promises to take readers behind the scenes of the sci-fi saga and reveal how the 6ft 7ins bodybuilder helped create one of the most iconic villains in cinema history. In this book of memoirs, Dave spills the beans on his journey from disadvantaged child and poor student to champion weightlifter and international film star. Prowse said: "I have had a great career and have worked with some incredible people and look forward to sharing my story with the fans." Apex Publishing's Chris Cowlin said: "The Dave Prowse story is one of determination and hard work and in this honest account he explains how he overcame the many setbacks in his life to achieve success and global recognition. "This book is a must have for Star Wars fans of all ages and will appeal to anyone who enjoys a truly inspirational and motivating real life story." Prowse was born in Bristol in 1935. He was a disadvantaged child from a working class background and grew up without a father. As a teenager, Dave developed an interest in bodybuilding and competed in the Mr Universe contest alongside his lifelong friend Arnold Schwarzenegger. After training hard, he went on to win the British heavyweight weightlifting title and became a highly respected health and fitness trainer. Dave trained Christopher Reeve for his role as Superman and has also trained Albert Finney, Daniel Day Lewis, Vanessa Redgrave and many other well-known stars. 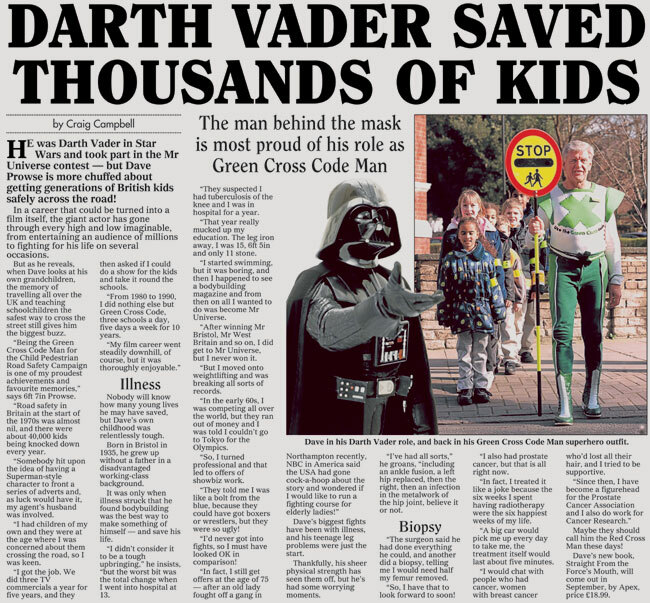 Prior to achieving fame with the Star Wars films, Dave was also known for his role as the Green Cross Code man (pictured above right) during the 1970s, heading up the UK Child Pedestrian Road Safety Campaign. He was made an MBE in the Millennium Honours List for his services to road safety and charity. His physique secured his entry into the world of showbusiness and he is possibly best known for his portrayal of Darth Vader, which catapulted him to international stardom. Dave has also appeared in a number of other films including A Clockwork Orange. Dave is the author of two previous books, Fitness is Fun and Play Safe with the Stars, and is in demand as a public speaker. 19 February 2011 - Dave Prowse MBE was interviewed on Bristol Community Radio 93.2 FM. 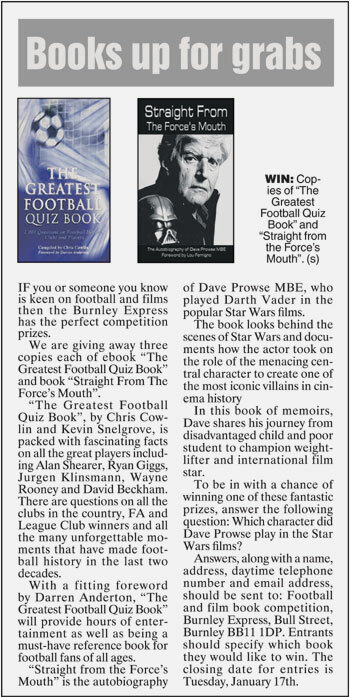 Dave answered questions about his book 'Straight From The Force's Mouth'. 18 August 2011 - Dave Prowse MBE was interviewed on Talk Radio Europe. 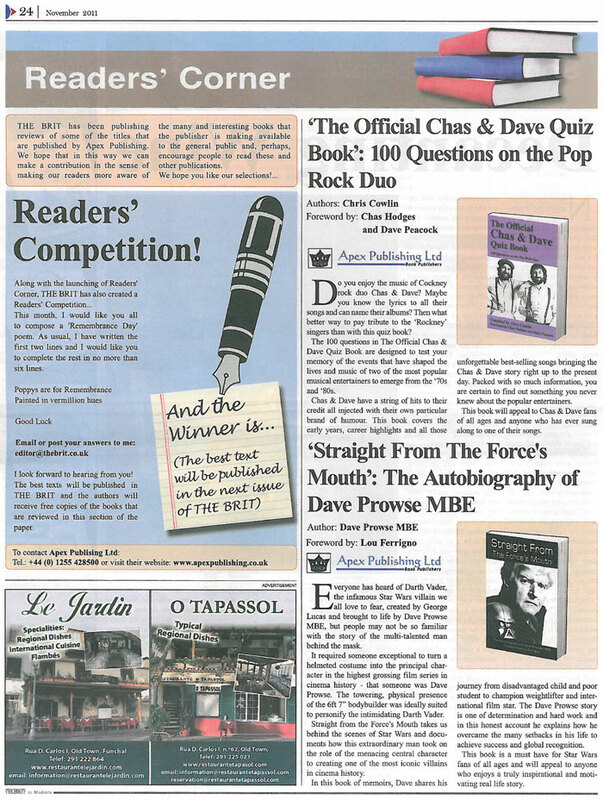 Dave answered questions about his book 'Straight From The Force's Mouth'. 5 September 2011 - Dave Prowse MBE was interviewed on BBC Radio West Midlands 95.6 FM. Dave answered questions about his book 'Straight From The Force's Mouth'. 6 September 2011 - Dave Prowse MBE was interviewed on BBC Radio Kent 96.7 FM. Dave answered questions about his book 'Straight From The Force's Mouth'. 8 September 2011 - Dave Prowse MBE was interviewed on Swindon 105.5 FM. Dave answered questions about his book 'Straight From The Force's Mouth'. 12 September 2011 - Dave Prowse MBE was interviewed on Pulse 98.4 FM. Dave answered questions about his book 'Straight From The Force's Mouth'. 12 September 2011 - Dave Prowse MBE was interviewed on BBC Radio Cambridgeshire 95.7 FM. Dave answered questions about his book 'Straight From The Force's Mouth'. 14 September 2011 - Dave Prowse MBE was interviewed on BBC Radio Scotland 92.4 FM. Dave answered questions about his book 'Straight From The Force's Mouth'. 25 November 2011 - Dave Prowse MBE was interviewed on 'The Moore Show' on Show Case TV (Sky Channel 201 and Freesat 403). Dave answered questions about his book 'Straight From The Force's Mouth'. Dave was interviewed by Kevin Moore. 14 September 2011 - Dave Prowse MBE was interviewed on BBC Radio Bristol 94.9 FM. Dave answered questions about his book 'Straight From The Force's Mouth'. 14 September 2011 - Dave Prowse MBE was interviewed on BBC Radio Derbyshire 104.5 FM. Dave answered questions about his book 'Straight From The Force's Mouth'. 15 September 2011 - Dave Prowse MBE was interviewed on BBC Radio Northampton 104.2 FM. Dave answered questions about his book 'Straight From The Force's Mouth'. 15 September 2011 - Dave Prowse MBE was interviewed on Lakeland Radio 100.8 FM. Dave answered questions about his book 'Straight From The Force's Mouth'. 15 September 2011 - Dave Prowse MBE was interviewed on BBC Radio Leeds 92.4 FM. Dave answered questions about his book 'Straight From The Force's Mouth'. 17 September 2011 - Dave Prowse MBE was interviewed on BBC Radio Coventry & Warwickshire 94.8 FM. Dave answered questions about his book 'Straight From The Force's Mouth'. 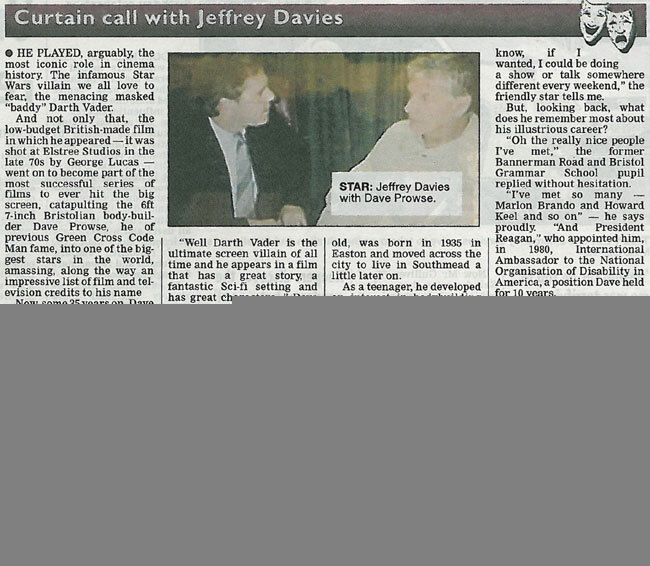 19 September 2011 - Dave Prowse MBE was interviewed on BBC Radio Devon 103.4 FM. Dave answered questions about his book 'Straight From The Force's Mouth'. 21 September 2011 - Dave Prowse MBE was interviewed on Forest 92.3 FM. Dave answered questions about his book 'Straight From The Force's Mouth'. 22 September 2011 - Dave Prowse MBE was interviewed on BFBS Radio. Dave answered questions about his book 'Straight From The Force's Mouth'. 26 September 2011 - Dave Prowse MBE was interviewed on BBC Radio York 103.7 FM. Dave answered questions about his book 'Straight From The Force's Mouth'. 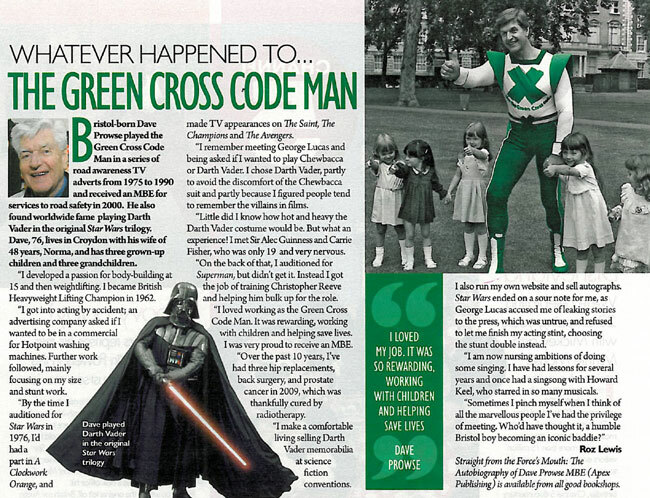 26 September 2011 - Dave Prowse MBE was interviewed on XFM London 104.9 FM. Dave answered questions about his book 'Straight From The Force's Mouth'. 26 September 2011 - Dave Prowse MBE was interviewed on Wythenshawe 97.2 FM. Dave answered questions about his book 'Straight From The Force's Mouth'. 26 September 2011 - Dave Prowse MBE was interviewed on BBC Radio Sussex 95.3 FM. Dave answered questions about his book 'Straight From The Force's Mouth'. 26 September 2011 - Dave Prowse MBE was interviewed on BBC Radio Kent 96.7 FM. Dave answered questions about his book 'Straight From The Force's Mouth'. 26 September 2011 - Dave Prowse MBE was interviewed on Wolverhampton City Radio 101.8 FM. Dave answered questions about his book 'Straight From The Force's Mouth'. 27 September 2011 - Dave Prowse MBE was interviewed on Leith 98.8 FM. Dave answered questions about his book 'Straight From The Force's Mouth'. 10 October 2011 - Dave Prowse MBE was interviewed on Absolute Radio. Dave answered questions about his book 'Straight From The Force's Mouth'. 22 October 2011 - Dave Prowse MBE was interviewed on Sheffield Star Radio. Dave answered questions about his book 'Straight From The Force's Mouth'. 27 October 2011 - Colchester Garrison 107 FM featured and ran a competition on 'Straight From The Forces Mouth' written by Dave Prowse. 29 October 2011 - Dave Prowse MBE was interviewed on BBC Radio Scotland 92.4 FM. Dave answered questions about his book 'Straight From The Force's Mouth'. 30 December 2011 - Dave Prowse MBE was interviewed on BBC Radio Coventry & Warwickshire 94.8 FM. Dave answered questions about his book 'Straight From The Force's Mouth'. 7 January 2012 - Dave Prowse MBE was interviewed on BBC Radio Derbyshire 104.5 FM. Dave answered questions about his book 'Straight From The Force's Mouth'. 15 February 2012 - Dave Prowse MBE was interviewed on BBC Three Counties Radio. Dave answered questions about his book 'Straight From The Force's Mouth'. 11 January 2015 - Dave Prowse MBE was interviewed on Wolverhampton City Radio 101.8 FM. Dave answered questions about his book 'Straight From The Forces Mouth'. Dave was interviewed on 'The Philip Solomon Show'. 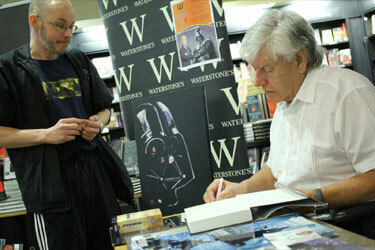 15 October 2011 - Dave Prowse MBE signed copies of his book 'Straight From The Force's Mouth' at Waterstone's, Croydon. 22 October 2011 - Dave Prowse MBE signed copies of his book 'Straight From The Force's Mouth' at Waterstone's, Orchard Square, Sheffield. 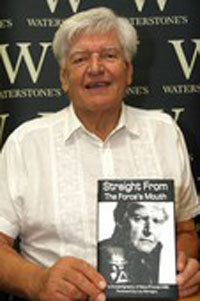 29 October 2011 - Dave Prowse MBE signed copies of his book 'Straight From The Force's Mouth' at Waterstone's, Cambridge. 30 October 2011 - Dave Prowse MBE signed copies of his book 'Straight From The Force's Mouth' at Waterstone's, Drake Circus, Plymouth. 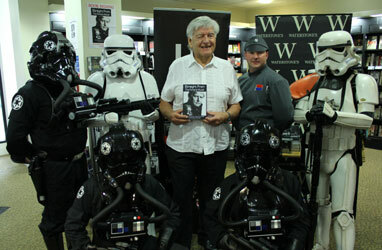 4 November 2011 - Dave Prowse MBE signed copies of his book 'Straight From The Force's Mouth' at Waterstone's, Cardiff. 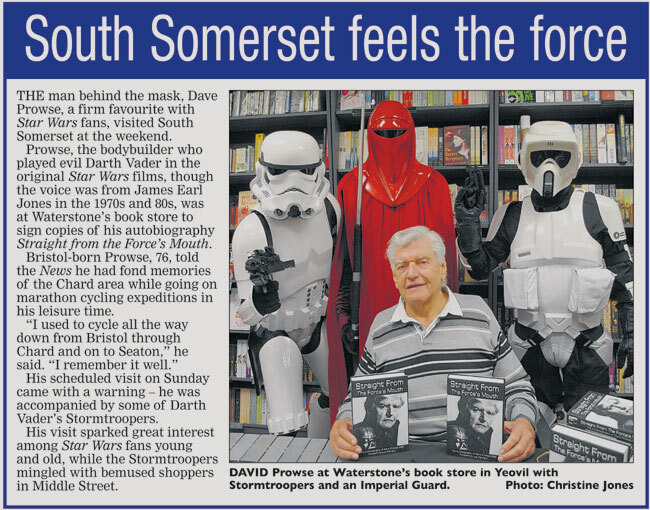 6 November 2011 - Dave Prowse MBE signed copies of his book 'Straight From The Force's Mouth' at Waterstone's, Yeovil. 5 November 2011 - Dave Prowse MBE signed copies of his book 'Straight From The Force's Mouth' at Waterstone's, Bristol Galleries, Bristol. 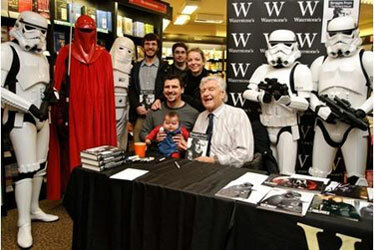 12 November 2011 - Dave Prowse MBE signed copies of his book 'Straight From The Force's Mouth' at Waterstone's, Kingston. 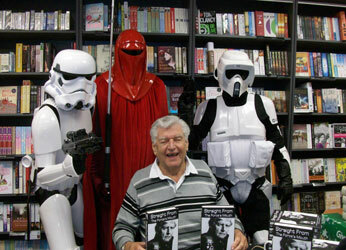 19 November 2011 - Dave Prowse MBE signed copies of his book 'Straight From The Force's Mouth' at Waterstone's, Taunton. 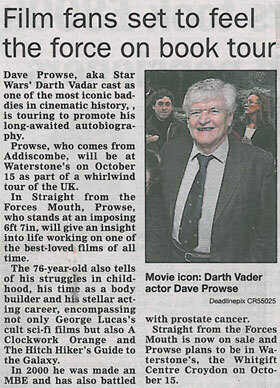 25 November 2011 - Dave Prowse MBE signed copies of his book 'Straight From The Force's Mouth' at Waterstone's, Hitchin. 26 November 2011 - Dave Prowse MBE signed copies of his book 'Straight From The Force's Mouth' at Waterstone's, Kings Lynn. 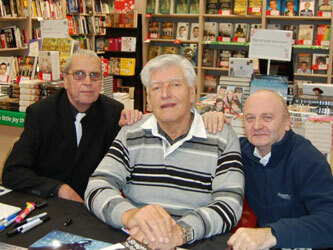 27 November 2011 - Dave Prowse MBE signed copies of his book 'Straight From The Force's Mouth' at Waterstone's, Basildon. 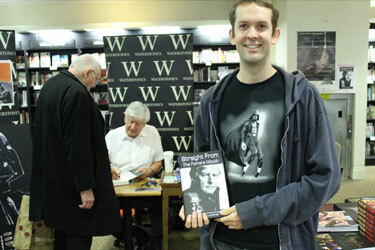 10 December 2011 - Dave Prowse MBE signed copies of his book 'Straight From The Force's Mouth' at Waterstone's, Wandsworth. 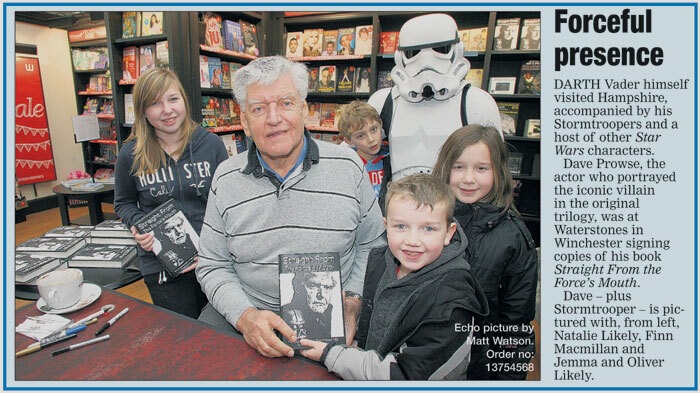 11 December 2011 - Dave Prowse MBE signed copies of his book 'Straight From The Force's Mouth' at Waterstone's, Bishops Stortford. 17 December 2011 - Dave Prowse MBE signed copies of his book 'Straight From The Force's Mouth' at Waterstone's, Deansgate, Manchester. 18 December 2011 - Dave Prowse MBE signed copies of his book 'Straight From The Force's Mouth' at Waterstone's, Trafford Centre, Manchester. 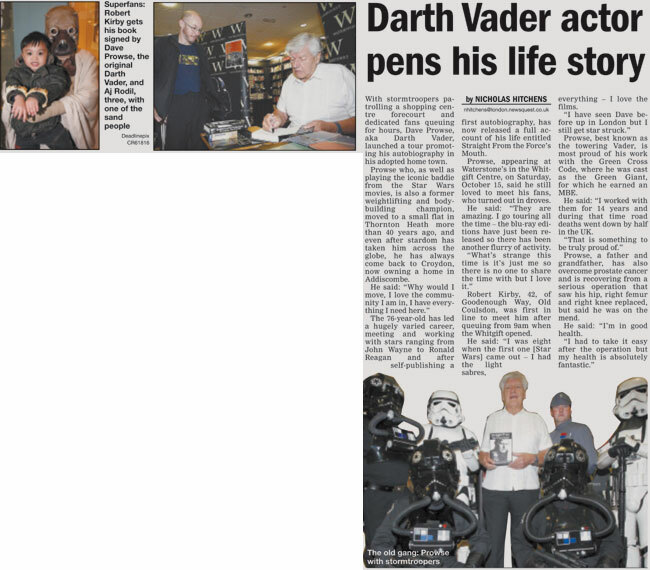 31 December 2011 - Dave Prowse MBE signed copies of his book 'Straight From The Force's Mouth' at Waterstone's, Lemington Spa. 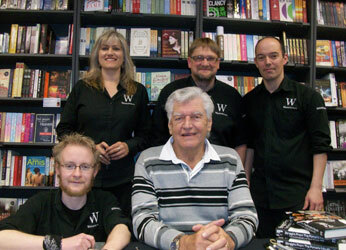 7 January 2012 - Dave Prowse MBE signed copies of his book 'Straight From The Force's Mouth' at Waterstone's, Derby. 8 January 2012 - Dave Prowse MBE signed copies of his book 'Straight From The Force's Mouth' at Waterstone's, Waterstone's, Bedford. 14 January 2012 - Dave Prowse MBE signed copies of his book 'Straight From The Force's Mouth' at Waterstone's, The Brooks, Winchester. 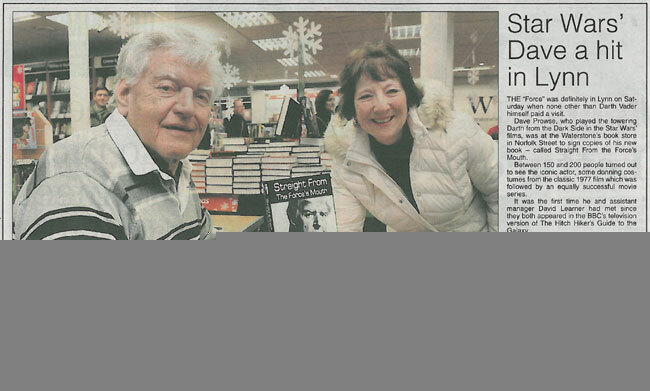 15 January 2012 - Dave Prowse MBE signed copies of his book 'Straight From The Force's Mouth' at Waterstone's, Stevenage. 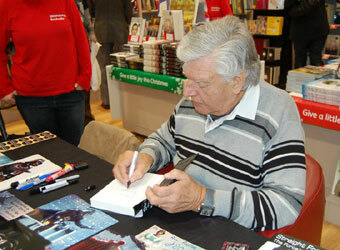 12 February 2012 - Dave Prowse MBE signed copies of his book 'Straight From The Force's Mouth' at Waterstone's, Woking. 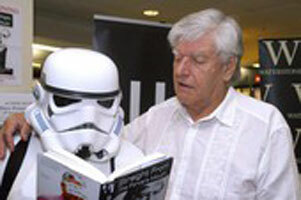 9 June 2012 - Dave Prowse MBE signed copies of his book 'Straight From The Force's Mouth' at WH Smith, Croydon. 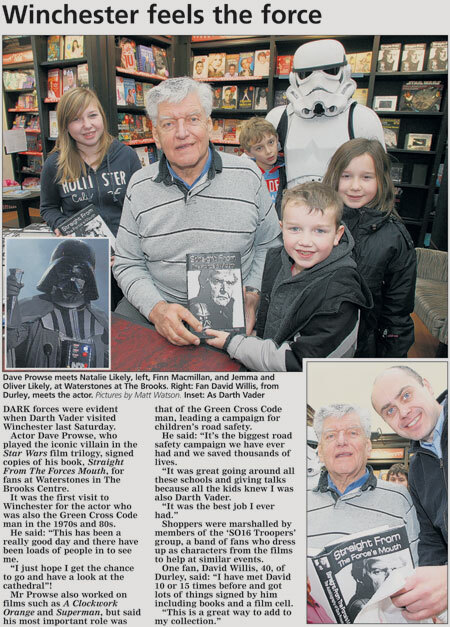 23 June 2012 - Dave Prowse MBE signed copies of his book 'Straight From The Force's Mouth' at Cole's Books, Bicester. 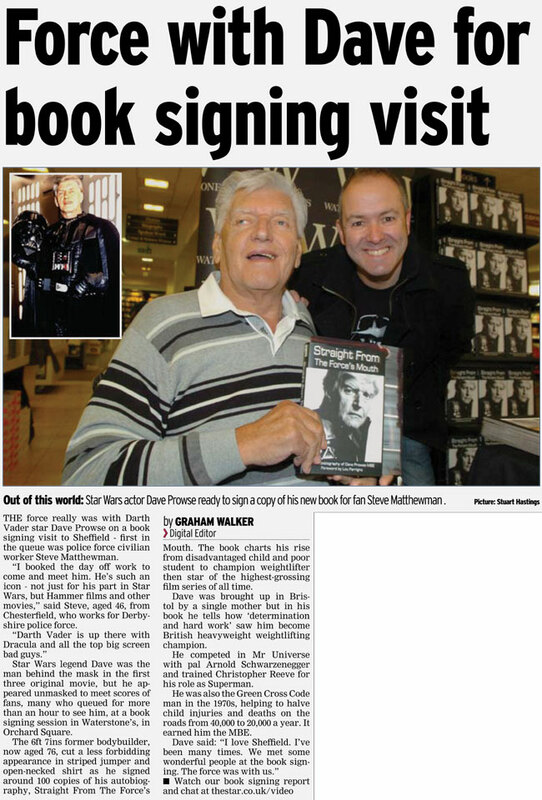 21 July 2012 - Dave Prowse MBE signed copies of his book 'Straight From The Force's Mouth' at WH Smith, Sutton. 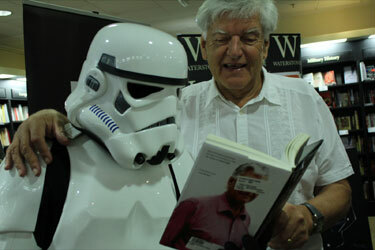 11 August 2012 - Dave Prowse MBE signed copies of his book 'Straight From The Force's Mouth' at WH Smith, Bromley.